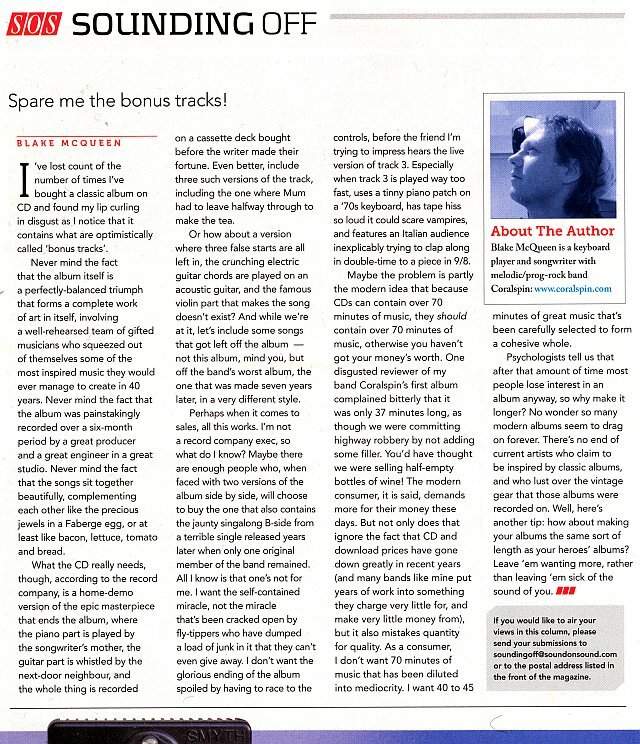 I had a guest spot in the ‘Sounding Off’ column in Sound on Sound magazine this month (June 2013), venting my spleen about bonus tracks, and the modern idea that CDs have to be long. It looks to be available even to non-subscribers. And here’s a scan of it. Don’t suppose SoS will mind — anyway, they took out some of my terrible jokes which made it seem more serious than it originally was! It’s good advertising for the mag, which is all like this (only much better and about recording and gear rather than moans. So quite different, really). Update: I should add that it’s not like I have no interest in the sort of tracks you get as bonus tracks. Sometimes they’re good, and as a musician and “recordist” even poorly-recorded, early versions of tracks can provide a valuable insight into the creative and recording processes of a band you like. I just don’t want them stuck on the end of a great CD. Release them as a separate, inexpensive CD. Or make them available as downloads on your website. Put them on a second CD you include with the album if you must (although I’m not that keen on that either). Whatever you do, just don’t put them on the classic album itself.